Where the sea impacted against land was Delphi Rock Lounge, a free-standing sea stack topped with a platform of deck chairs. It connected to the mainland by a thin, concrete bridge. The last staircase down to the tiny beach was a terrifying, dizzying concrete staircase with no handrail and a 4-5m plunge to the sand below. From the bottom, it didn’t seem too bad, but from up high, it looked like it might crack, give way and fall at any moment. 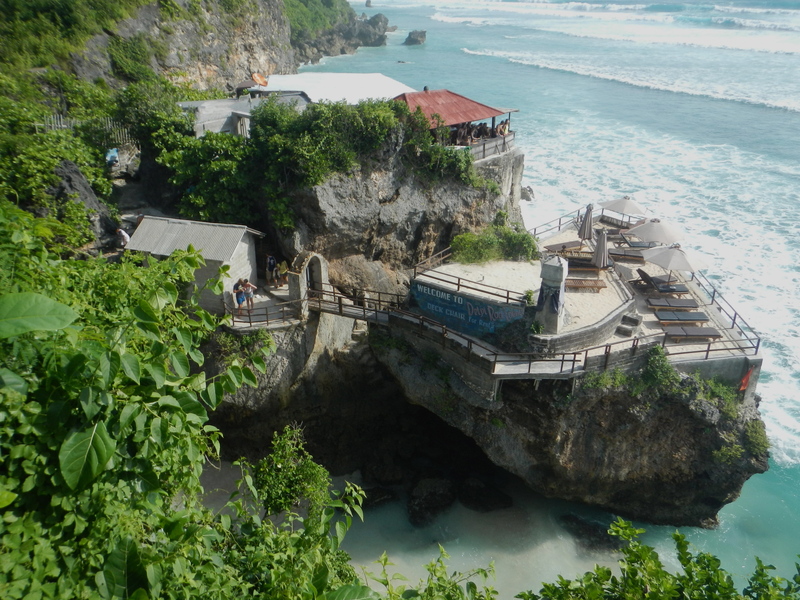 This led to the cave, filled with locals, tourists and a few surfers. The sea was roaring in through a channel created by Delphi Rock Lounge and the mainland, being channelled to a mini sand bar. The entrance to the Rock Lounge was barred by iron gates and rusted barbed wire. I don’t blame them for shutting it off; if a drunken sunbather was going to fall and have a horrible neck injury; it’d be here. 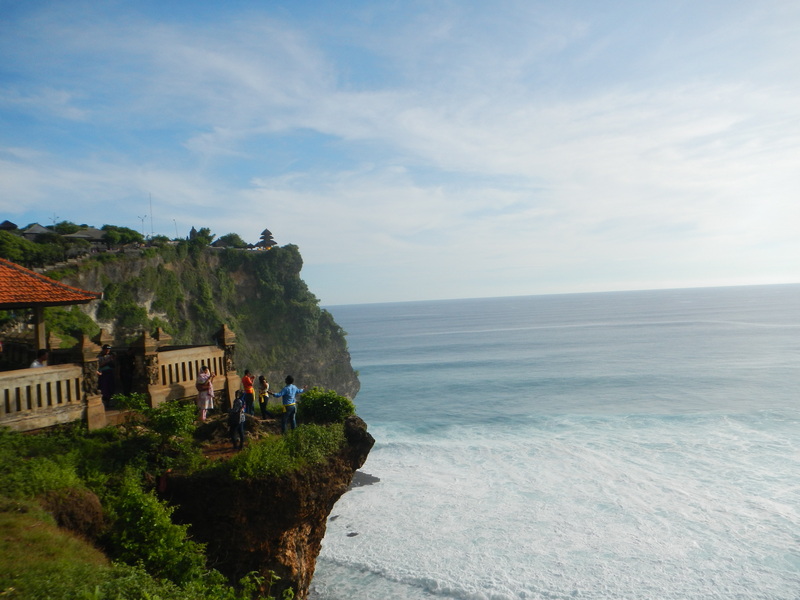 Not far along the coast line was Pura Luhur Uluwatu, a lonely Balinese temple staring out listfully across the ocean, where it has been protecting the island from evil spirits for a thousand years. The temple stands spectacularly on the highest point of a sheer cliff. 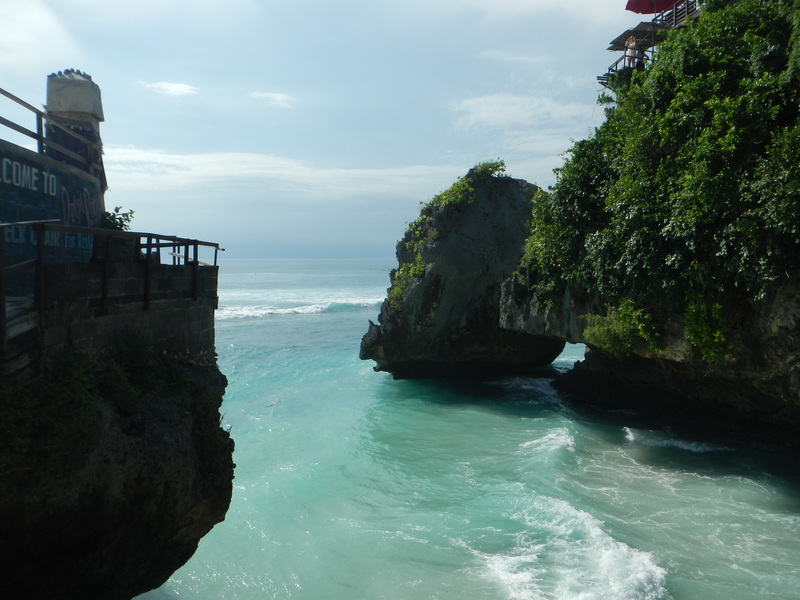 For many hundreds of metres either side of the temple, a short pillared guardrail runs up and down the heights of the surrounding cliffs. Making your way from one end to the other, breathing the cool ocean air, admiring the rolling land views, is just stunning. 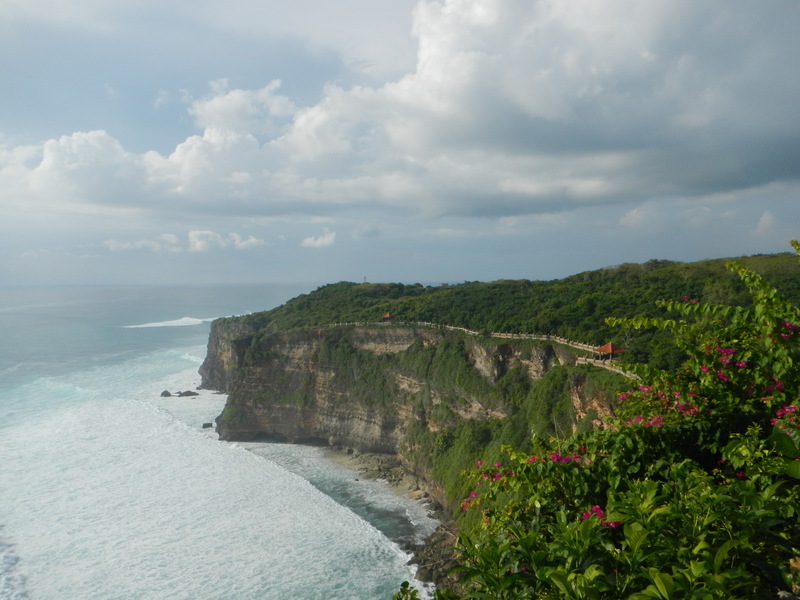 A community of morbidly obese macaques inhabit the grounds of Uluwatu, where they lead their comfortable, greedy lives fighting and eating fruit. Rambutans and peanuts can be purchased at the entrance to the grounds (as well as the obligatory sarong), and with all the visitors, the macaques certainly get all the food they need. Letting a monkey climb your body to reach the fruit that you hold high above your head is quite fun, but the primates can occasionally be aggressive. 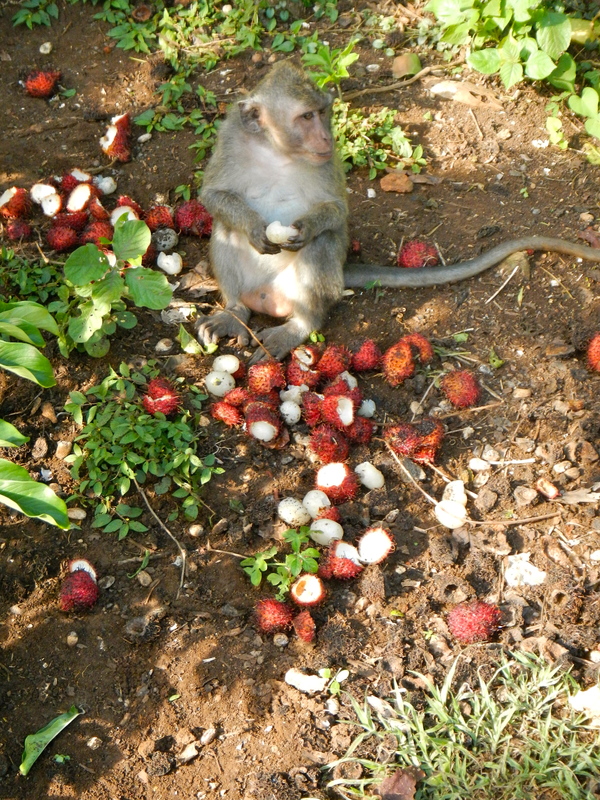 Cindy had her rambutan bag ripped from her hand by one gluttonous macaque. We spotted one feasting on a pile of a stolen rambutans, rolling shamefully in his own food, and another one viciously ripping apart a pair of flip flops.